Wood routers are handy tools when it comes to cutting and shaping wood for functional and decorative purposes. At its core, a wood router is used to rout (hence the word “router”) or hollow out an area in the face of a workpiece that is typically made of wood or even plastic. Wood routers are often used in woodwork, especially cabinetry work. It is also commonly used as a plunging tool and you may also see it inverted in a router table. In this article, we will demystify the wonders of wood routers and also highlight the things you should consider when purchasing a wood router. Last but not least, we will also share our top 5 best wood routers picks with the included wood router reviews. How Does a Wood Router Work? Wood routers have blades that revolve at high speeds and these blades scrape off any wood that comes their way. Imagine a sharp knife rotating extremely fast! That’s essentially how a wood router works to create the cut outs in wood boards, including the accents and decorations that one simply cannot produce with a regular saw. Without wood routers, most of your furniture pieces will not have those interesting accents and cut outs that you see today. What Should You Consider When Buying a Wood Router? Wood﻿﻿﻿ routers usually come with a fixed base or a plunge base, though there are a handful of models that give you the luxury to switch between the two. A plunge router can move up and down the base, which has spring-loaded arms on both sides, allowing the user to manually “plunge” the cutting bit down into the material from above. This is essential when you’re working on the top of a board (rather than the edge), for applications such as fluting, dados, grooves and rebates, insets, etc. Plunge routers can also be used for edge work. You can profile edges using a plunge router with a round-over bit. As its name suggests, a fixed base router is locked at a fixed location in the base, so the cutting bit cannot move (or “plunge”) from top to bottom. This means that it’s virtually impossible to perform some of the abovementioned tasks that a plunge router can accomplish, particularly where you need to work on the material from the top. That said, fixed base wood routers are useful when you need to make super precise cuts. This is important when you’re doing tedious woodwork like dovetail joints. Also, fixed based wood routers are generally smaller and lighter, so most people may find it easier to maneuver and control a fixed base wood router than a big, tippy plunge wood router. In addition, fixed based wood routers are the preferred choice over plunge base wood routers when used with a routing table. It’s easier to adjust the depth of the bit for a fixed based router, and as mentioned earlier, it tends to be more precise than a plunge router when it comes to maintaining its locked position. With a plunge router, you may need to buy accessories if you wish to adjust the bit depth without having to remove the base from the table. In view of the above, a combo router would give you the best of both worlds. However, combo wood routers are usually more expensive. For the budget-conscious, I would suggest that you consider your needs when deciding between a fixed base or a plunge wood router. For novice woodworkers who have not decided on the particular use of the wood router or woodworkers looking for an all-purpose tool, I would recommend that you get a plunge router which will provide you with a much wider range of use than a fixed base router. If you intend to use the wood router with a routing table or largely for profiling edges and cutting dovetail joints, then a fixed-base wood router will be a better option. Horsepower determines how powerful your router will be. Of course, higher horsepower also comes with a price (not just a more expensive price tag)— it comes with a heavier weight. Therefore, only go for a higher horsepower if your routing work really requires it. Most wood routers deliver horsepower within a range of 1 ½ HP to 3 ½ HP, with a corresponding 3 amps to 15 amps. If you only need to do light profiling work, a wood router with a horsepower below 2HP should serve you well. A collet is the steel sleeve that holds the router bit in a wood router. It works with the router shaft, which is connected directly to the router motor, and the collet nut. Most wood routers are available with ¼-inch and ½-inch collets. The collet size indicates the size of the bit shank that the wood routers can take. Generally, wood routers with ½-inch collets are more suitable for a wider range of use as ½-inch shank bits may have larger diameters. There are some wood routers that come with adaptors that can take on ¼-inch or 3/8-inch shank bits. The last thing you want when ramping up your wood router is for the tool to jerk out of your hand without warning. A soft start feature solves the problem by bringing the router speed up at a gradual pace so that the tool will not jerk out of position. This is useful for first-time wood router users and even experienced users when working around tricky maneuverers and cuts. A variable speed feature helps you select the ideal speed for different applications, bit sizes and material types. If you plan to work with various wood types, it is best to use a wood router that offers variable speed control functions, so that you don’t end up damaging your wood router because the speed isn’t suitable for the wood type. Grips are not just an aesthetic feature, they are an important connection between you the user and the wood router. When selecting a wood router, it pays to check out if the grips are slippery or flimsy. The grip handles should fit your hands well. Slippery handles can be a safety hazard and you should avoid wood routers with flimsy grip handles at all cost. Now that we have a better understanding of wood routers, it’s time to unveil our top five picks of the best wood routers that are currently available in the market. For less than $100, you can get a decent wood router that gets the job done. 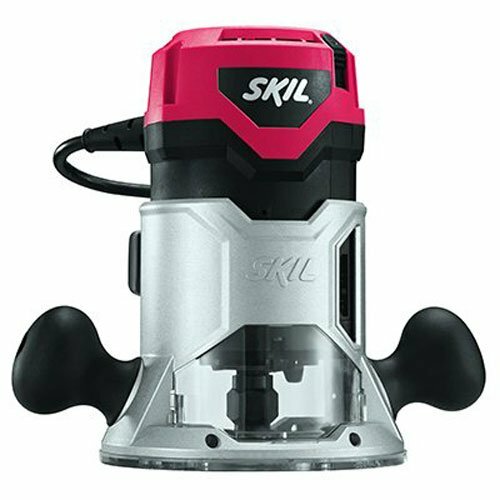 The SKIL 1817 fixed base router comes with 1 ¾ HP which is powerful enough for most routing tasks. This wood router also includes other good-to-have features such as its soft start technology for smoother start-ups and longer motor life, micro depth adjustment for accurate depth measurements, dual position switch for better control and soft-grip handles for holding the router. This wood router has a ½-inch collet that can accommodate larger profile applications like thicker wood pieces. This fixed base wood router is ideal for woodworkers who intend to use the tool for rounding and producing smooth edges, and cutting basic wood patterns. It also comes with a one-year warranty. If you are on a tight budget and don’t need a plunge router, this is a good wood router choice. Indeed, it’s no wonder that this wood router is selling fast with many rave wood router reviews 2019. If you’re looking for a combo wood router that can do fixed-depth and plunged routing, you should definitely consider the Bosch 1617EVSPK. 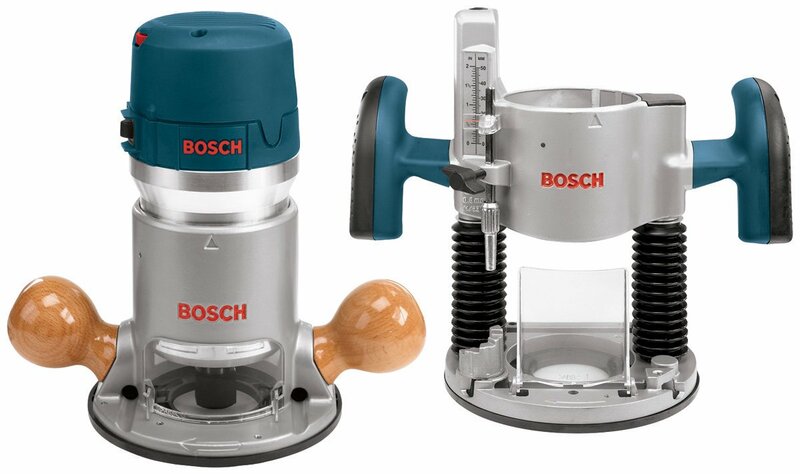 This wood router comes with fixed and plunge bases, and both bases feature the Bosch Precision Centering Design. This trademark design makes it easier to keep the bit on your intended cutting-line with the help of guidance devices like jigs or templates. The fixed base comes with well-finished wooden handles while the plunge base comes with soft grip handles. Wood router reviews 2019 also highlighted this wood router’s other cool features include its threaded rod for fine-depth adjustment for greater precision, variable speed dial to adjust to the desired speed, soft start feature and its wrench collect system that keeps the wrench in position and makes it easy to change bits. At 2 ¼ HP, this wood router is rather powerful without being too noisy. Many customers have praised this wood router for being fairly quiet even when operating at full speed. The Bosch 1617EVSPK comes with a one-year warranty too. For the best combo wood router, look no further from the Bosch 1617EVSPK! The DEWALT DWP611PK may be light at 8lbs but it packs a punch when it comes to its cutting power, build quality and plunge action. At 1 ¼ HP, its motor is relatively less powerful than the abovementioned wood routers but sufficient for most of the usual woodworking tasks. Like the Bosch 1617EVSPK, this DEWALT router also features a variable speed control mechanism and a soft start motor. One of the main highlights of this wood router is its plunge action. 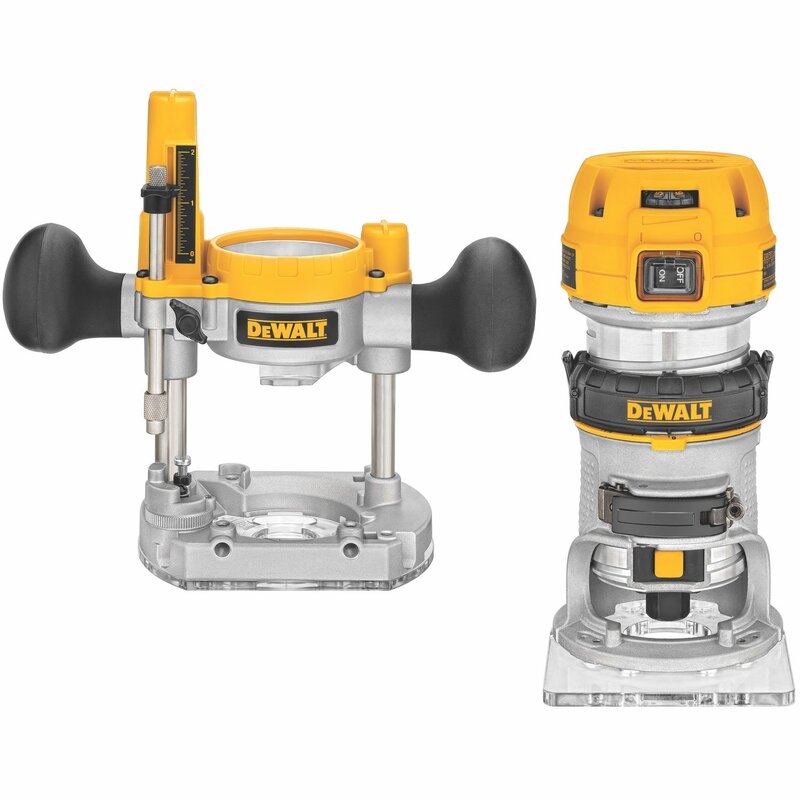 According to wood router reviews 2019, many customers have high praises about the DEWALT DWP611PK’s smooth plunge action that allows the user to accurately lower the bit into a cut. For depth adjustment, the DEWALT DWP611PK has a rod that can be adjusted easily through its range and a quick action release that pulls the motor from the base swiftly. The ¼-inch collet depth is a bit of a shame, but it will still do the job to grip the shank of most bits. For less than $50, you can top up to purchase the wood router along with a round sub base and an edge guide, which is why we have featured the DEWALT DWP611PK as the best value-for-money wood router combo kit. Like the DEWALT DWP611PK, the Porter-Cable 690LR is also a lightweight and nimble wood router at just 9.4lbs. 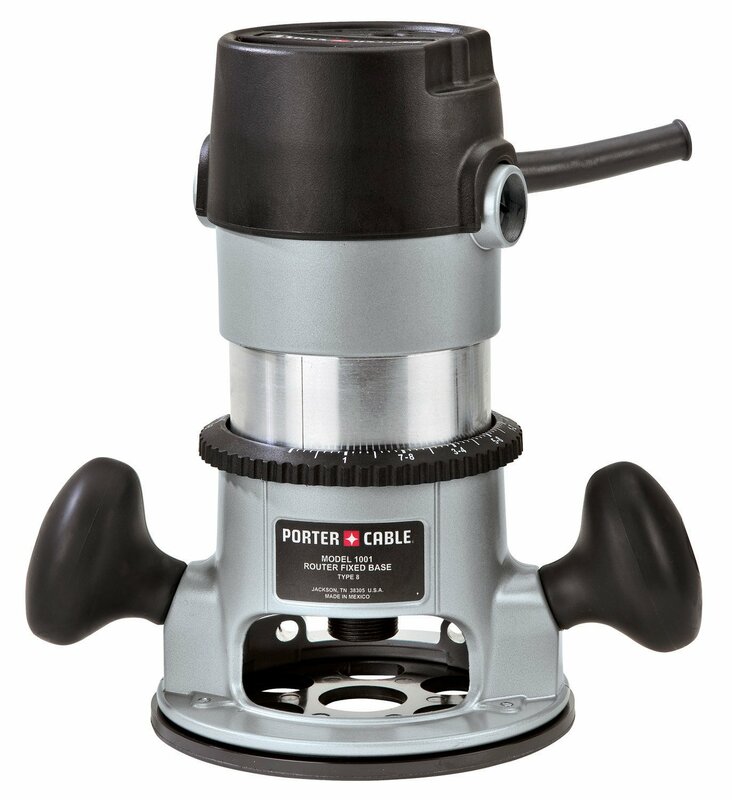 The key difference is that the Porter-Cable 690LR is a single speed wood router. This is a great wood router if most of your routing jobs involve smaller applications and you do not need to operate the wood router at different speeds. The Porter-Cable 690LR is equipped with a 11-amp motor that produces 1 ¾ peak horsepower. This DEWALT wood router lives up to its claim of generating an impressive 27,500 rpm for quick and precise cuts. Other features include an auto-release collet system that makes it easy to remove bits, ergonomically designed grips for comfort during extended jobs and dust-sealed components to protect the tool against wear and tear. What’s more, wood router reviews 2019 also say that this wood router is compatible with many standard accessories in the market like bushings, edge guides, etc. It also comes with a three-year warranty. So, if a single speed wood router is sufficient to meet your needs, the Porter-Cable 690LR is a great wood router to consider! This wood router comes with good power at 2 ¼ HP with an impressive noise level of just 79.5dB, variable speed control, quick and easy depth control, soft start, ergonomically designed features, plunge base for swapping, and a five-year warranty. The Hitachi M12VC is the wood router that fits all these criteria. Its powerful 2 ¼ HP 11-amp motor that can be operated at variable speeds ranging from 8,000 to 24,000 rpm. With its many features, it’s no wonder that many wood router reviews 2019 have called the Hitachi M12VC one of the best in the category of 2 ¼ HP variable speed routers. 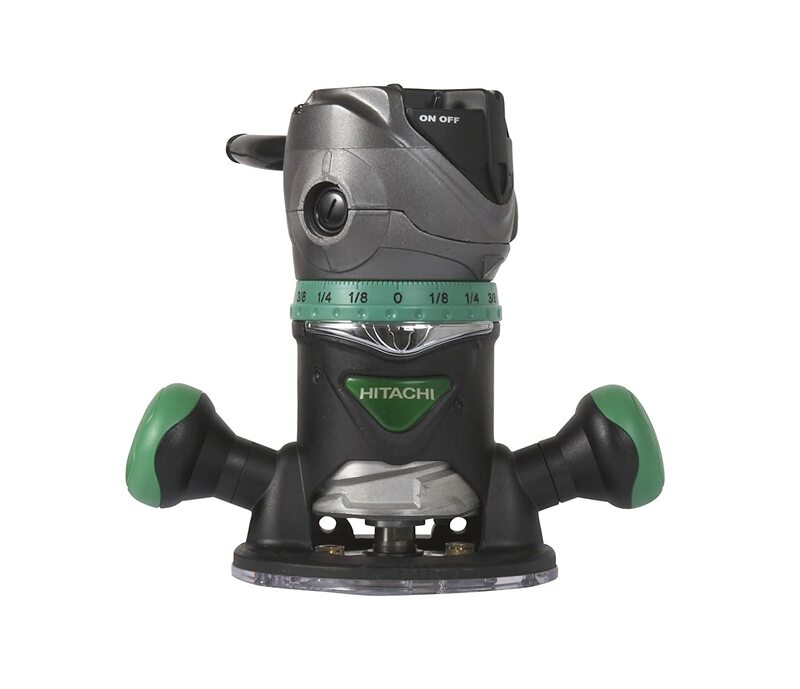 Another feature unique to this Hitachi wood router would be the Elastomer compound wrapping around the router’s handles to minimize vibration and prevent slippage for better control over the tool. Although this is a fixed base wood router, there’s a release clamp for users who would like to change to a plunge base (plunge base needs to be separately purchased).